Everyone needs a treat once in awhile. But these days, while we’re all trying to eat healthy, treats can make you feel guilty. Am I right? We’re eating this really yummy goodie and all the while thinking, “I shouldn’t be eating this.” Sigh. It makes it hard to enjoy stuff, ya know? This is my answer to all those microwaveable [insert name of baked good here] in-a-cup things that are going around these days. Those things are usually full of NOTHING NUTRITIOUS; and they don’t even really bake up well. The bottom often comes out as either powder or uncooked dough — and the guilt level is VERY high. Let’s just forget about those and go with something that works and also leaves us still feeling good about ourselves, shall we? The best thing is that this fruit crumble is super quick and easy to make — because that’s how I roll. No recipe on this blog will ever be difficult!! The expense level may vary just a little bit – sometimes you just gotta cough up a little more dough to make something ah-mazing – but the difficulty level will always be SOOPER DOOPER EASY. This recipe, happily, happens to be both — it costs mere pennies to put together and takes only a few minutes. We are just reducing the guilt in every way we can on this one! 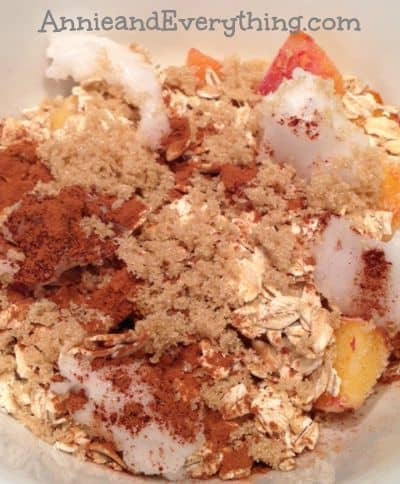 So today I present you with my recipe for Gluten- and Dairy-Free Individual Fruit Crumble. Quick, easy, good for breakfast, lunch, dinner, or dessert – or bedtime snack. Truly yummy. ½ – 1 cup fresh or frozen chopped fruit or berries – I most often make this by chopping up one apple. But berries work great, as do any kind of chopped fruit. And don’t worry about thawing it if it’s frozen, just be sure it’s chopped. A couple of handfuls of gluten free rolled oats (don’t you love my scientific measuring process? Exact measurements are so NOT crucial to this recipe. 🙂 ) – you could use either instant or regular; I personally like regular because it gives a crispier outcome. 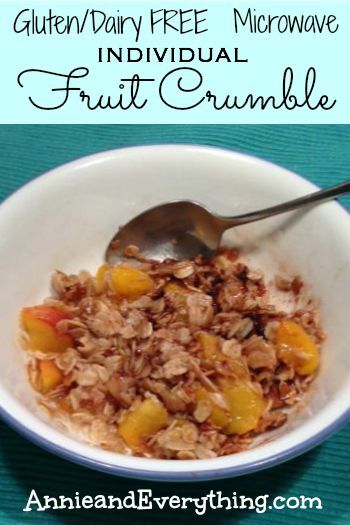 (In the old days, this recipe would have been called “Individual Fruit Crisp,” because technically it was a crisp that had oats in it, while a crumble did not — but nowadays they are interchangeable. The things you learn when writing a blog!) I don’t recommend steel-cut oats, but only because I haven’t tried them. If you try them and they work, let me know! 4-6 dabs of coconut oil, or if it’s melted, then just pour a couple tablespoonfuls over the top – If you don’t have coconut oil in your pantry yet, y’all, it’s time to start stocking it. This stuff is SO GOOD FOR YOU. I might write a post called “Ode to Coconut Oil” sometime, I love it so much. It’s the coconut oil that enables me to make this dairy free – if dairy is not a problem for you, then you can substitute in some butter instead of the coconut oil. So this should have taken you a grand total of about 30 seconds, maybe a minute if you had to chop the fruit. Now just place the bowl in the microwave, uncovered, and cook at regular power for about 2 minutes (fresh berries or other soft fruit I might do a little less – you could try 1 ½ minutes first — but it’s pretty much impossible to overcook this thing, so don’t get too stressed about it). This is long enough to soften the fruit, melt the coconut oil, caramelize the sugar, and give the oats a little crispness. Guess what? You’re done already! Do let it cool for a little bit before attempting to eat it, though (um, learned that one the hard way…). This recipe comes in handy for me A LOT. I always have some kind of fruit around, and oats are a staple in my pantry. Even when there’s nothing else to eat, I can make this fruit crumble in a jiff and be treating myself to a sweet snack that isn’t too guilt-inducing in just a very short amount of time. Now you can, too!